Whenever we welcome a recently rescued pet here at Francisvale, I often catch myself holding my breath. If we’re lucky – whew! – the new arrival comes to us in good health, with a sunny disposition and few bad habits. But when a tiny Shih Tzu named Garrett was rescued not long ago, I knew we weren’t going to be so lucky. As soon as he arrived, we noticed that he limped badly. It looked like he favored his right front leg. And his head bobbed when he moved – a sure sign of pain, as I’ve come to learn. A trip to the vet confirmed our suspicions: A deformed right front leg has affected his elbow and begun dislocating his shoulder. It’s not uncommon for Shih Tzus to have bone deformities. But Garrett’s problems are outsized for a dog so small. Garrett shows a bit more spine than I would with such a painful problem. Our volunteers walk him daily, and he gets around as best he can. And considering his painful condition, in the best of spirits, too. In fact, he has proven to be one of the gentlest dogs under our roof, good with children as well as our other lodgers – cats and dogs both. And he never tires of lying comfortably in your lap. Garrett is lucky in one respect; he came to Francisvale. As a no-kill shelter, Francisvale is committed to assuring that rescued animals like him get the medical attention they need. In Garrett’s case, that means extremely complicated arthroscopic surgery to correct the limb deformity and repair his shoulder. After we got the good news that Garrett can be helped – whew! – came even more stunning news. Even after the vet’s huge discount, it would cost $5,000 for the surgery – far more than we can afford from our day-to-day budget for routine veterinary care. 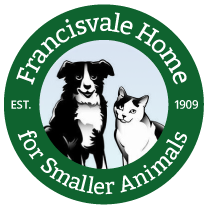 It wasn’t long ago that I asked for your help meeting the day-to-day expenses of caring for the 90 abandoned cats and dogs who have found their way to Francisvale – hopefully on their way to happy, adoptive homes. But even with the generous donations we’ve received so far this year, I’m afraid Garrett’s operation will stretch us to the breaking point. And that’s why I’m writing to you today. You and I share the belief that every animal counts, that even abandoned animals like Garrett deserve to live healthy lives, free from debilitating pain and fear. That’s why I am asking for your extra financial help to get Garrett the care he needs. Garrett won’t die without surgery. But without it, he’ll be trapped in a life of constant pain and impaired movement. His operation is just a few weeks away, and we haven’t raised nearly enough to pay for it. If you can help, please, click the button below; it’s the quickest and easiest way to help Garrett. Please, we could really use your extra help right now. This entry was posted on Sunday, February 10th, 2013 at 3:26 pm	and is filed under News.